1. When the Canadians said they never look at “those things,” what “things” are they talking about? It isn’t just taxing, Marty. We have desirable pollution control laws, worker safety laws, safer roads, safer water and food, cleaner air, more health care, (which may not mean “better health care”,) better housing, more cars, consumer protection, rule of law, sometimes, etc. These things cost money, and since we are stuck with dollars, politicians and industrialists have sold our future overseas, for short-term gains. It is a familiar issue in Texas, where Mexican and other illegal workers rent cheap houses and hot bunk up to 30 people in a three bedroom modest house, sending most of their pay home, until they can get an anchor baby and go on the free-stuff-for-kids rides our governments have created. Meanwhile, working-class Texans can’t afford a tiny house in a bad neighborhood, in Austin Metro and other areas. Much less health care, insurance etc. They compete, head to head with the aforesaid illegals. On the macro scale, how does say, Dell, return manufacturing to America, when they are paying 10% of the labor cost, probably 20% of the regulatory cost, almost no legal costs, de minimus pollution abatement costs and no workers’ compensation, by comparison, etc.? I don’t see how tax cuts can stop that imbalance. Yet we have hundreds of millions of fellow citizens who are over a barrel and need more and higher paying jobs. I know a guy with a wife and two kids who were supporting them on one wage and good money management but left the St. Louis area due to social meltdown. Came to a suburb of Austin, got a job at a grocery store, living with parents, and then realized, after saving a grubstake, that his wages cannot rent a crappy 2 bedroom house in a bad neighborhood, with more than $200 a month left over. Their solution? Move to an even cheaper state – Florida. We’ll see. ANSWER: The scenarios that people make up as to what central banks make their decisions on are the headlines in the press – inflation & jobs normally. The inflation indexes have been so manipulated that they will NEVER reach the 15-20% level of the 1980s. Back then, they included real estate which was 40%. That was removed because they determined it was an “asset” and not really cost of living so it was replaced with rents and then they more often used urban rents that were controlled. You have to understand that the entire budget and social programs were indexed to the CPI. So, the NUMBER ONE way to reduce deficits was to reduce the CPI index so politicians did not have to vote to cut programs and suffer the arrows launched by the public. The Federal Reserve is prone to raise interest rates regardless of the economic data because they have been manipulated too low and has set in motion a crisis in pensions. On the other hand, raising rates too fast blows the deficits out since governments are the relentless and biggest borrowing in the economy. It is just not plain-vanilla management as people portray. There are far more serious issues including capital flows which they are all now finally beginning to take notice. On Part-II, you are absolutely correct. The biggest cost of labor is NOT the actual wage paid to an employee. It is the benefits, taxes, and regulatory costs. As I said before, when I was restructuring major multinational companies to cope with the birth of the Euro, those who needed skilled labor I place in Britain, not Germany. The cost that an employee never sees was 40% less in Britain compared to Germany. I was called in urgently by a major company who had a branch in Germany. I was asked to come to the board meeting the next day and was not even briefed in advance what was the crisis. When I got there, they appoint me advisor to the pension fund and then most of the board resigned. I asked what was going on? They wanted to lay-off 25% of the workforce and the Germany government finally agreed. At the last minute, they instructed the company that they COULD NOT pick and choose who to lay-off. They had to offer 100,000 to give up their job “willing” no less. Everyone who knew they could get another job took the 100k and left. The very people they wanted to get rid of stayed. That was how regulators screwed up companies. I encountered the same stupid policy in Grece. The higher the tax burden, the lower the standard of living. The tithe was an obligatory offering from the law of Moses requiring 10 percent of an Israelite’s firstfruits. We are so far beyond that it is destroying our civilization. As you can see we take the total consumption of government as a percent of GDP. There is just no end in sight. 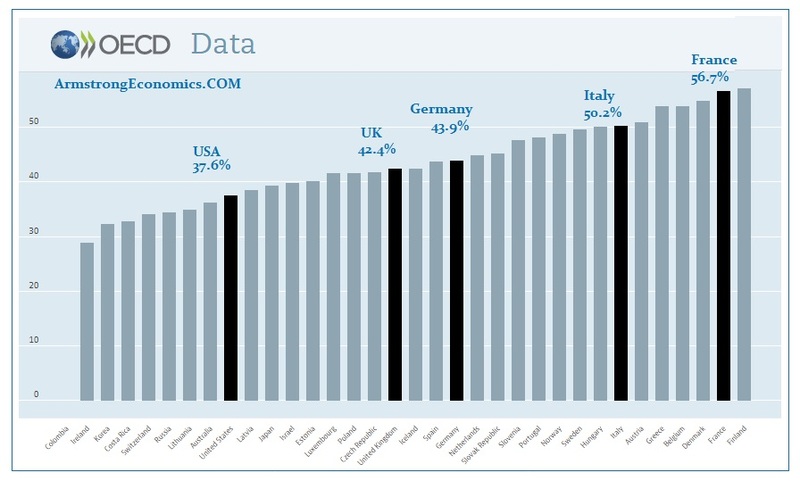 The USA economy is doing far better than Europe as a whole simply because we are at 37.6% of GDP compared to the insanity of France where Communism began – 56.7%. Among the states in the USA, we are witnessing major migration from New Yor, New Jersey, California, Illinois, and Connecticut just to mention the top contenders. The people are burdened by the taxes and they do not stop if you try to retire. They want income tax and property taxes when you retire and many people simply cannot afford to live in those states anymore. The tax burden never ends and when you die, they want to pick over your bones. 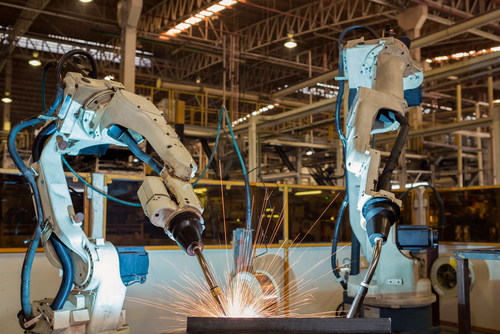 The development of robots is to simply eliminate the benefits and regulatory costs. The worker sees this as just his hourly wage. But the real costs in far too often 50% of the wage or higher from the company’s perspective. Even the Post Office is hiring part-time to avoid pensions and benefits. As for shipping off programming to foreign lands, it still requires staff here to monitor them and the end product is rarely 100% acceptable. The communication problems also impact that situation and make it less attractive than what it appears on the surface. It just takes a lot more management from afar.